There’s been a big myth-understanding. This film takes the folk legends about Bigfoot and the Abominable Snowman and turns them the other way. 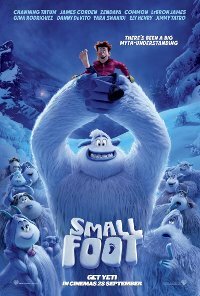 We follow a young yeti who is convinced that a human known only as “Small Foot” is real, and sets out with the help of his friends to prove to his tribe that it does exist. This leads them to wonder what else may be out there beyond their village. This film is releasing in 2D and 3D. This is the 2D version. You’re right, he does have a small foot. Violence Low impact, fairly frequent, non-threatening, cartoon violence.